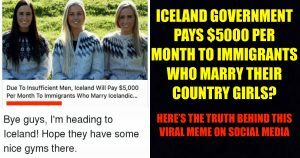 ‘The Government Will Pay You If You Marry An Iceland Woman?’ The Hoax? The Internet has become an encyclopaedia for any kind of answers, unfortunately, the home for the hoax and misguiding news too. There were various moments when someone too much admired is dead on newspapers, media websites and some weird blogs. All those tactics were to be the sauce of attention in this web loving world. Long back there was a news stating that the Nordic Island nation ‘Iceland’ will pay any foreigner if he gets married to an Iceland woman. Crazy reasons were added in order to justify this nail-biting statement, most important of them, the Iceland is low populated and dearly to its immigrants. Fingers crossed! That’s the hoax folks, now wake up from your Internet believing brains and dig yourself into reality. Coming to the fact, no country will ever pay you for marrying its country’s woman, this world is already full of people and less population is never a threat, unlike more population. Clearing the clouds of ambiguity, sources from and Icelandic media channel claimed that the news was a hoax and there’s no issue of less population right now. The situation is even better now as the new statistics actually shows slightly more men than women in Iceland, with 1,007 men for every 1,000 women in general. Meanwhile, in its capital city Reykjavík, there are 985 men for every 1,000 women, however, in the countryside the ratio considerably fair with 1,129 men for every 1,000 women. So guys! now kill your plans of going to Iceland, no government ever makes such kind of law except the false blogs that cash out the stupidity out of people.